There was still some light in the sky that evening after supper, when everybody started shuffling over to find a spot near the fire. The heat of the day had faded only slightly. Still, they were carrying extra layers and puffy jackets. And headlamps: one thing these last three weeks in the woods had taught them was that no matter how much they’d sweated under their packs during the afternoon, once the sun slipped behind the canyon, the world got very cold and dark, very fast. The 20- and 30-somethings nodding in response were medical students, most just days away from graduation and the start of residencies at teaching hospitals in Delaware, Minnesota, New York, Virginia, Massachusetts. Soon, when the phone rang at 3 a.m. with the news that a patient couldn’t breathe or was having chest pains, they’d be the ones who would have to decide what to do. For now, though, they were still medical students, and this was one last chapter in their education: a course called “Medicine in the Wild,” a month-long backpacking expedition through western New Mexico’s remote Gila Wilderness, where they learned how to cook pizza and brownies from scratch over a gas flame and to tie their food in trees out of the reach of bears, how to read a compass and follow a trail map, how to set up a campsite and find water and cross a river safely. They’d seen javelinas (small wild pigs native to the Southwest) and a rattlesnake and heard coyotes; one night, some of them had watched several elk crossing a meadow, bigger than anything they’d imagined, bugling wildly. A couple of people had spotted a bear. The course, led by instructors from the National Outdoor Leadership School (NOLS) and a fourth-year medical resident from Harvard, also introduced them to wilderness medicine, which is pretty much what it sounds like: providing emergency care, using limited tools, to people who get sick or injured in remote environments (Harris’s succint definition boils it down further: “the provision of resource-limited medicine under austere conditions”). Along the way, there’d been lectures and simulated scenarios—the most dramatic was a feigned leg fracture, requiring the students to construct a litter out of backpacks and sticks and carry the “patient” to a helicopter rendezvous at the top of a hill. Now, finally, near the end of this arduous, exhilarating adventure, the 12 students were sitting around a fire with Harris, who has spent years practicing what they had come here to learn. 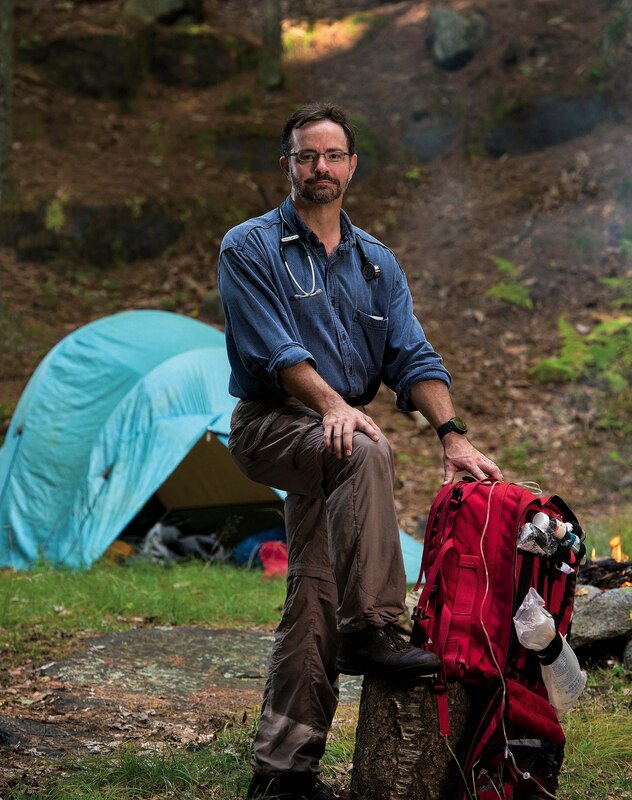 An emergency-medicine doctor at Massachusetts General Hospital (MGH) and associate professor of emergency medicine at the Medical School, Harris is also a wilderness physician. Now 50, with a silver-threaded beard and a honeyed Virginia drawl, he has looked after patients on the slopes of Denali and in the Everest region of Nepal, in northern Japan after the 2011 tsunami, and in the vast and empty reaches of Siberia. He’s accompanied scientific missions to the Amazon and the Mekong as the doctor on call in case something goes wrong out in the wet and tropical middle of nowhere. Nine years ago, Harris founded MGH’s wilderness medicine division (he’s now chief), a part of the emergency department, and he directs its fellowship program. He’s also one of the founders of this NOLS course; every spring he swoops in to teach the final segment. He’d met up with the group not long after daybreak, hiking in from a campground five miles away, where he’d spent the night after leaving his rental car at the end of a narrow twisting road through ponderosa pines—following a three-hour drive on Interstate 10, and two flights in from Boston. That afternoon, sitting under the trees alongside the middle fork of the Gila River and the soaring jagged walls of Little Bear Canyon, he’d given a talk on altitude illness, his principal area of research. Now, in the falling darkness, it was time to talk about Chekhov. Harris had asked the students to read the short story “Misery,” a sharp study in casual inhumanity and uncompassion. Set in 1880s St. Petersburg, it follows a cab driver in deep despair over the death of his young son. Several times he tries to share his grief with his passengers and fellow cabbies. No one listens. They don’t even let him get the words out. The story ends with him unburdening himself instead to his horse. Everyone stared into the fire. Harris told them a little about Chekhov: the son of a serf who worked his way into medical school, a writer as well regarded in his own time as now, a man whose social conscience propelled him on a 6,000-mile journey to investigate and write about the forced-labor prison camps in Russia’s far east. “Exactly,” Harris answered. “The healing influence of listening.” He noted how easy it can be, in everyday medical settings, to feel too busy for listening. But taking the time—and sometimes it’s only 30 seconds—to hear the person in front of you is important. In the wilderness, away from X-ray machines and MRIs and blood-chemistry workups, the patient’s testimony and a physical exam are often all the doctor has to go on. The patient history, Harris said, is the diagnostic engine of medicine. At their campsite in Little Bear Canyon, in the Gila Wilderness, Ma (left) and NOLS student Kenny Chao use a cook pot and a gas flame to turn spices and dried ingredients into dinner. Backcountry cooking is one of the skills the NOLS course teaches, and students learned to make everything from basic meals to pizzas and brownies and cornbread. The final morning of the students’ backpacking journey through the Gila Wilderness unspooled into a long, and sometimes searching, discussion of the environmental-themed books they had read. This year’s conversation included A Sand County Almanac, by Aldo Leopold, the ecologist and U.S. Forest Service supervisor who was instrumental in the Gila’s 1924 designation as the nation’s first federal wilderness area. Sometimes it’s more than that. “When I was in Japan after the tsunami,” he recalled, “I kind of felt stupid after a while, because, since it was a cold-water tsunami, most people had either died—gone hypothermic and drowned—or they were basically fine. And so then you show up to try to help, and I felt like I was mostly sitting around hearing a lot of stories.” Venturing out from the school that had been transformed into a shelter and hospital, he made house calls on survivors in a devastated coastal town, sat in people’s kitchens, drank their tea. Many of them were in their eighties and nineties, and their stories astonished him; he still chokes up thinking about their dignity and graciousness in the face of overwhelming loss. But Harris wasn’t sure he was doing much to help. Why was he there, he wondered. Later he realized the listening was the why. “Medicine is the most human of the sciences,” Harris told the students, who were now fully bundled into their jackets. Someone got up and put a fresh log on the fire; the night deepened around them. “The most human of the sciences,” he said again. That’s perhaps even more true in the wilderness, which strips away sophisticated implements of the physician-patient relationship and lays bare its most basic elements. By the eleventh century, naval surgery in the Mediterranean was handled by barber-surgeons. In the early 1600s, English naval surgeon Thomas Woodall pushed nautical healthcare forward with The Surgeon’s Mate, a text guiding shipboard doctors through wound treatment, fractures, and amputations. Woodall’s observations on scurvy were ahead of his time. A century and a half later, Admiral Horatio Nelson—whose career with the British navy included firsthand run-ins with malaria, yellow fever, depression, lacerations to his back and abdomen, a blinded left eye, and an elbow so destroyed by grapeshot that his arm had to be amputated just below the shoulder—swept in a new era of disease care at sea. In North America, military medicine moved to the front lines after the Civil War, reintroducing tourniquets and other tools to the battlefield. Amid battles with Native American tribes, civilians and doctors alike began using instruments like the belucum, whose invention dates as far back at 500 b.c.e., to extract arrows from wounds. Frontier medicine added another ancestral thread to wilderness medicine. When Lewis and Clark and their Corps of Discovery set off for the Pacific in 1804, Clark was serving as expedition doctor. He had no degree but enough medical knowledge to tend to the corps (on the two-year journey, only one person died, a Sergeant Floyd, likely felled by appendicitis). Other “physician/naturalists” followed, write Quinn and Rodway, as explorers ventured farther into unmapped, and often extreme, territory. Increasingly, these were trained doctors who could also serve as field biologists, and they were, as Clark had been, skilled outdoorsmen integral to the mission. Doctors accompanied explorers into the depths of the ocean, and to the North and South Poles; in 1912 English physician, painter, and ornithologist Edward Wilson died on Antarctica’s Ross Ice Shelf with Robert Scott and three other crewmembers from the doomed Terra Nova expedition. As expedition doctor, Harris accompanied a 2016 research mission to Thailand’s Mekong River. In the fall of his junior year, he took a semester-long NOLS course in the Rockies. The curriculum was intense: 30 days learning mountaineering in Wyoming’s Wind River Range, two weeks of caving in the Dakotas’ Jewel Cave National Monument and Wind Cave National Park, two weeks of climbing at Devil’s Tower National Monument, then two weeks of winter mountaineering, and, finally, two weeks in the desert. By the end, he’d been living outdoors for 95 days. He felt safe and comfortable and confident in the deepest wilderness. It was the most tremendous experience he’d ever had. After graduation, he didn’t know what to do, so he left the country. An English major at Sewanee, he applied to an exchange program that sent young Americans to towns and villages across Japan to teach English. Harris ended up in a high school in Iwaizumi, a little village in the mountainous, snowy north, about 10 miles from the Pacific Coast. When he arrived, he spoke no Japanese. He was, he believes, the first foreigner to live there. His life there was strange and often isolating, and he loved it. He studied judo every day (he has a black belt) and practiced his mountaineering skills; he read constantly and learned to speak passable Japanese. He wrote a novel, never published (“It was terrible, but I learned a lot”), which he based loosely on Shakespeare’s The Tempest. It was about a young man’s coming of age and environmental awareness. When he returned home at the end of that second summer, a letter was waiting for him in Virginia: an acceptance to the University of Iowa’s prestigious M.F.A. program—he’d applied using a chapter from his unpublished novel. Classes were starting in a week. Harris packed a bag, jumped in his car, and started driving west. That was 1993, the year of the Great Flood, when the Mississippi and Missouri rivers reached levels not seen in 100 years. Iowa City was partially underwater, so he camped out at a nearby state park for two weeks while he went to class and looked for a place to live. And yet, by the time he left Iowa’s creative-writing workshop, he knew he was bound elsewhere. The fall after his graduation, he started classes at the Medical College of Virginia. The son of two doctors, Harris had grown up hearing medicine spoken at the dinner table every evening, and the profession had always remained in the back of his mind, even as he roamed elsewhere. (“You can’t turn off being a writer—it’s in you,” Vendler says, but “you can’t turn off being a doctor, either.”) He’d learned CPR as a kid, and during a drive through the Virginia mountains with fellow summer-campers when he was about 15 years old, the group came upon an accident. A woman had jumped out of a moving vehicle and split her head open. “Everybody in the van turned and looked at me,” Harris says, “like, ‘You can stabilize this.’” He and the others did, stopping the bleeding and holding her spine in place until the ambulance arrived. As a medical student 15 years later, Harris found his way to emergency medicine—it was the specialty that combined everything he loved about all the other rotations—and in 1999 he began his residency at Harvard. Already, he was intent on making wilderness medicine his academic focus. MGH wilderness medicine fellow Nathaniel Mann (standing tallest in the rear) at the gate to Manang, Nepal. Mann served with other volunteer physicians at the Himalayan Rescue Association’s Manang clinic. MGH wilderness medicine fellow Nathaniel Mann (standing tallest, in the rear) grins beneath the gate to Manang, Nepal. Mann served with other volunteer physicians at the Himalayan Rescue Association’s Manang clinic. Usng a handheld ultrasound to gather data for a study on altitude illness, Mann takes an image of a patient's optic nerve sheath. A town of about 6,500, Manang is a gorgeous-but-grueling several days’ trek from the MGH fellows’starting point in Kathmandu. The wilderness-medicine division officially launched in 2008, though MGH had been offering training in that field since 2003. The program has graduated nine fellows, who arrive as practicing physicians, typically at the end of their emergency-medicine residencies. Like Harris, they are also experienced outdoorspeople: skiers, mountain climbers, backpackers, scuba divers. “Adrenaline junkies,” one former fellow joked. A love for wild places and environmental advocacy are built into the program. In Nepal each year, the fellows are stationed at two mountain clinics run by the nonprofit Himalayan Rescue Association. One is in Manang, a town of about 6,500 at the foot of the Gangapurnapurna glacier; bordering two major hiking routes, it is a popular resting spot for trekkers. The other is in Pheriche, a smaller village a little higher up—elevation 14,000 feet—two days’ hike from Everest Base Camp. The trip out to each from the fellows’ starting point in Kathmandu involves several days’ hike through steep, rocky, and usually snow-covered countryside. There are boulders and 500-foot cliffs. Cell-phone access is nonexistent, and the clinics are small stone-and-mortar structures outfitted with basic medical supplies and heated only by a kitchen cookstove that burns yak dung, and only during the day. In April 2015, when a 7.8-magnitude earthquake struck Nepal, MGH fellows Renee Salas and Laura Phillips were there. Salas, who now is second in command in the wilderness-medicine division, as assistant fellowship director, was then at the Pheriche clinic. At about noon that Saturday, she heard people screaming and buildings collapsing. It took a few seconds to realize what was happening. She felt, she said later, like someone on a boat in heavy seas. About nine hours after the shaking stopped, patients started arriving, and during the next 24 hours, she and the two other doctors received roughly 75 injured people in their four-bed clinic, many of them critically hurt, whom the doctors tried to keep alive and stable until they could get them off the mountain and into a hospital. One room of the clinic became a makeshift ICU and the doctors borrowed dining rooms and lodges from locals whose homes were still standing. As soon as the weather cleared, they started evacuating patients, 18 at a time, on a jumbo helicopter. “Everybody was doing what they could,” Salas says. A woman from a neighboring village who worked in a pharmacy and knew how to take vital signs helped triage the most fragile patients; others arrived to carry stretchers; a group of women whose home had been destroyed brought tea. People came without knowing what they could do to help or what was needed. They just came. In the frenzied crush of those hours, the usual paperwork and patient charts fell by the wayside. People simply talked to each other. That’s how they made sense of what was happening, who was where and who needed what. Salas remembers the overwhelming humanness of it, a story unfolding, everything immediate. This is sort of thing Harris is talking about. Several years ago, he did a patrol as a National Park Service climbing ranger on Denali. Along with four or five others, he followed the glacier up to 14,000 feet, then climbed the ridge to the “high camp” at 17,000 feet and the summit at 20,320 feet (a route pioneered by Bradford Washburn ’33, A.M.’60), to help staff the seasonally operated medical-aid station. “We were the last patrol of the season, so we were responsible, ultimately, for the whole mountain,” Harris says. They saw a couple cases of HAPE and recovered the body of a professional climber who fell and died, but the stories Harris tells are about the long night he spent waiting for a helicopter with a patient who may have been having a heart attack and the hours he spent with a former staff sergeant with an amputated leg who was climbing as part of a “wounded warrior” group. “An impressive guy,” Harris says. He got into pulmonary trouble, and after Harris had done what he could for him, he stayed by his bedside, talking and listening, until the weather cleared and they got him evacuated. The sickest patient Harris ever saw in the wilderness was in 1999, during his first time working in Nepal, as a medical student on a fellowship. A Tamil climbing guide had fallen ill while chopping tent platforms in the Khumbu Glacier for a climbing party half a mile below the Everest Base Camp. “He was sitting there alone, looking kind of purple and all hunched over,” Harris recalls, with a heart rate in the 120s, a respiratory rate of 50 (normal is less than 20), oxygen saturation in the 50s (normal at that elevation is in the 80s), unable to walk: a clear case of HAPE. An expedition doctor had misdiagnosed him with pneumonia and given him antibiotics. By the time Harris came across him, he says, the man was almost dead. Harris and others got him into a clinic and gave him oxygen and medicine, and the next day, after he was stabilized, they put him on a yak and sent him down the mountain. (He didn’t have the money for a helicopter evacuation.) Three days later he was back, grinning, healthy, “looking like a rose,” and ready to return to work. “That’s classic for HAPE,” Harris explains. “You can be sicker than hell and on the verge of death, and then days later the fluid clears and you’re back.” He and the man stayed in touch for several years. Harris and the MGH division also have a longstanding partnership with Woods Hole Research Center scientist Max Holmes, whose Polaris Project analyzes permafrost and river water to investigate the causes and consequences of climate change. Every summer, Holmes takes a group of 15 to 20 students and researchers into the field, often to Siberia, more recently to Alaska. Since 2011, when a member of the team fell ill with atrial fibrillation in Siberia, necessitating, as Harris calls it, a “big, hairy” State Department evacuation, Holmes and his team have taken Harris or one of the fellows with them. There’ve been no big scares since that one, though there are “endless minor things that could escalate if we weren’t on top of it.” Holmes says that Harris’s presence has had another, unexpected benefit. “From a mental-health perspective, it really helps for people in the group just to have someone to talk to confidentially. Participants are away from home in a remote environment for an extended period. Often we’re camping out. There can be language issues, weather issues, lack of sleep. We’re dealing with a lot of extremes.” Harris listens, and it helps. On a weekday evening this past spring, Harris was on the floor of the MGH emergency department, in the middle of an eight-hour shift that was scheduled to end at 11 p.m. but would stretch past midnight. He was recently back from the Gila Wilderness, and in a few days he would fly out to Alaska, to make house calls by float plane on patients living in tiny rural, and often impoverished, villages in the far northwest. After that, he’d head into the permafrost to meet up with Holmes and the Woods Hole crew. In 2011, Harris volunteered with a climbing ranger patrol in Denali National Park, staffing the medical station at 17,000 feet and helping to rescue ill and injured climbers. “We were the last patrol of the season, so we were responsible, ultimately, for the whole mountain,” Harris says. Harris (kneeling) and fellow members of the climbing ranger patrol prepare a patient for a helicopter evacuation. Harris (far left) and the others help place the patient aboard the helicopter. He said those words again and again during the night—to someone with heart palpitations who’d almost fainted reaching for a glass of water; a young cancer patient who’d come in with unexplained bleeding, her husband kneading his hands as he sat by her side; an obese man with sores running the length of his belly; a patient on a religious fast who needed stitches and fluids; an old woman with pneumonia, sweet and funny and pretty, so slight she almost disappeared into the sheets; a garrulous man whose low blood pressure seemed to have no immediate explanation; a woman recovering from surgery who was angry and tearful and in pain everywhere. “Can you tell me your story?” And they did, about the tattoos on their arms and the sweltering heat the day they were born (“My poor mother”) and the pain and weakness and the sweating or shaking or shortness of breath. Lydialyle Gibson, Harvard Magazine staff writer and editor, has recently profiled Susan Cain  and Jennifer Lewis  in these pages.